Given the controversy over the City of Eureka and Humboldt Bay Harbor District’s plan to dump dredge spoils on Samoa Beach yet again, Humboldt Baykeeper has been getting a lot of questions about dredging. 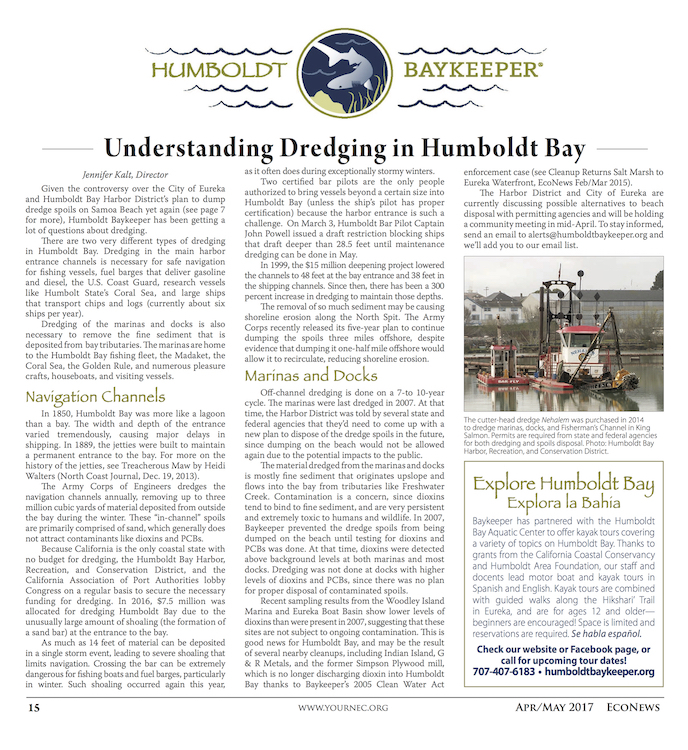 There are two very different types of dredging in Humboldt Bay. Dredging in the main harbor entrance channels is necessary for safe navigation for fishing vessels, fuel barges that deliver gasoline and diesel, the U.S. Coast Guard, research vessels like Humbolt State’s Coral Sea, and large ships that transport chips and logs (currently about six ships per year).